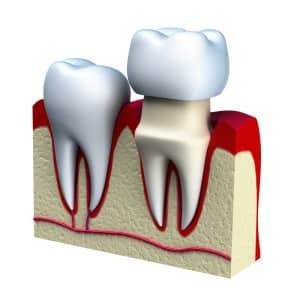 Are you already in the know regarding the way a dental crown can save your tooth? While you are pleased with the potential benefits, do you still recognize that you have remaining questions about how that crown will affect your general oral health – and how you will be able to keep your smile in good condition with the addition of a prosthetic tooth? Allow us to fill in the blanks (or help you discover that you know the answers to your questions) by taking an educational quiz. True or False: A dental crown protects your tooth beneath, helping prevent future tooth decay or infection. True or False: Keeping your crown clean is extremely complicated. We will explain which types of brushes you need as well as specially formulated mouthwash. True or False: In addition to protecting your tooth after significant damage or oral disease, a crown can also improve the balance of your bite. True. We fully clean and prep the remaining tooth tissue before placing a dental crown over it. The crown restores your structure, so you may enjoy full function again. It also keeps plaque and bacteria off of the natural tooth tissue. False. Keeping your dental crown clean is just as simple as keeping your natural smile clean. Keep up your usual dental hygiene habits, which include brushing, flossing, and scheduling your twice-annual appointments for a dental cleaning and a dental checkup with our practice. True. The length, shape, and general dimensions of each tooth may promote a balanced bite – or may disrupt the balance of your bite. Fortunately, our carefully crafted, customized crowns will fit comfortably with your other teeth, which can help prevent strain and discomfort, as well as problems like bruxism or TMJ disorder.